Is that Jacqueline Trudeau and friends sailing off into the sunset? It just seems that way. You don’t want to know when we first started this boat. Okay, Okay… it was June…. June of 2013. Yikes. Time flies (actually it crawls) when you are scripting main and jibsheet movement. Introducing Trudeau’s return to the “big boats”, our 12 Metre racer/cruiser, our first new boat in nearly 2 years. Based on the real life 12 Metre class, the yachts that raced in the America’s Cup competition for nearly 30 years from the 1950s through the 1980s, the Trudeau 12 Metre is an accurate scale model of these celebrated boats. Yes! 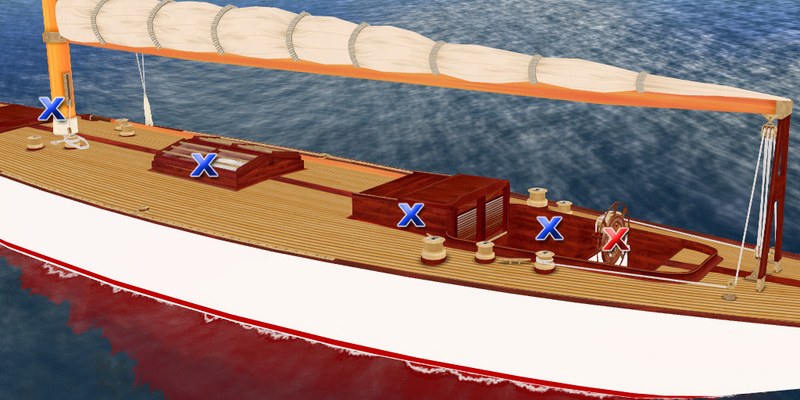 It’s more like 70-80 ft in length – “12 metres” doesn’t indicate the boat’s length, but rather the result of a complex formula whose variables include waterline length, sail area, beam, freeboard, “girth” (the measurement taken around the boat from one sideboard, under the keel, and then over the top on the opposite side back to the original side) – boats designed to this class were first built in 1907. The America’s Cup competition, suspended during the second world war, when resumed more economical vessels were needed to replace the huge and expensive J-class yachts that were raced in the 1930s; the 12 Metre class was selected. 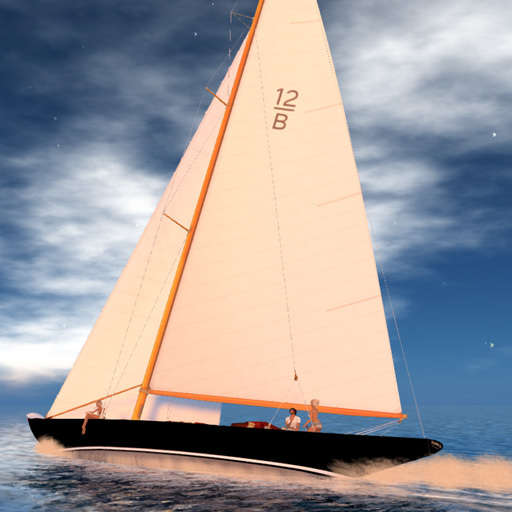 We also selected the 12 Metre as a successor to our popular J-Class boat, they are similar in inworld size (the real world J Class boats were nearly twice the size of the 12 Metres). Size is about the only quality in common between the Trudeau J-class and Trudeau 12 Metre. 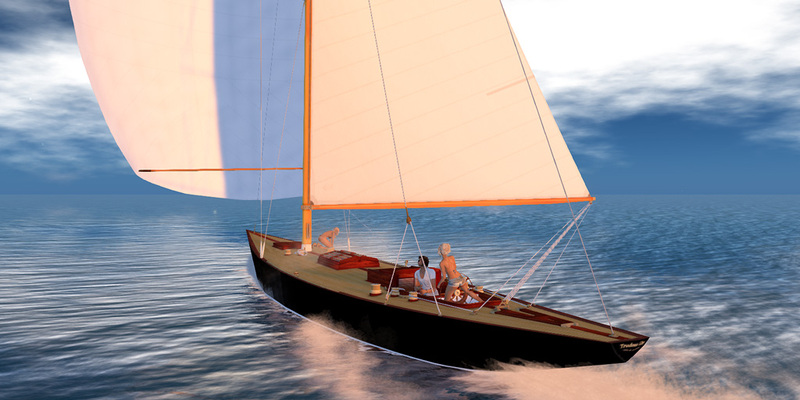 Our 12 Metre is constructed of mesh, her lines and detailing are completely accurate and taken from the 1937 wooden 12 Metre “Trivia” (whose wonderful site can be found here), she has animated running rigging, full complement of sails – main, jib, genoa, spinnnaker – and many other details. Of course it wouldn’t be a Trudeau boat if all aboard didn’t help offset heeling by hiking out in several positions, so they do! 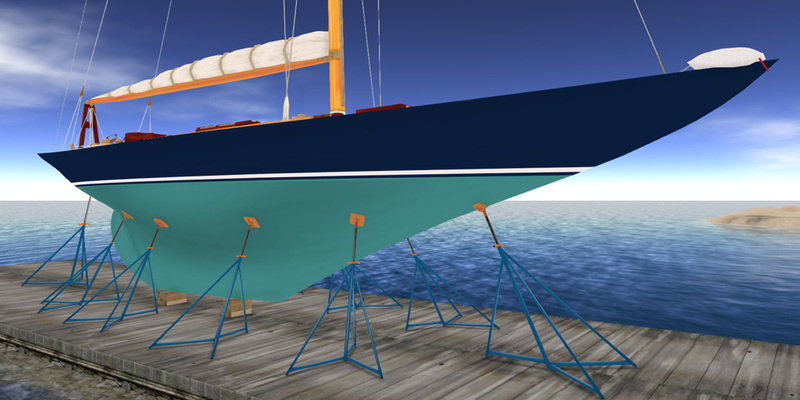 You’ve probably noticed a lot of full cabin boats in Second Life have quite high freeboard (the distance between the boat’s waterline and sheer). SL boat designers face the same issue that RL boat designers do – attempt to get the maximum cabin headroom while still maintaining a pleasing and efficient profile. One technique used is lowering the cabin sole (the floor of the cabin). 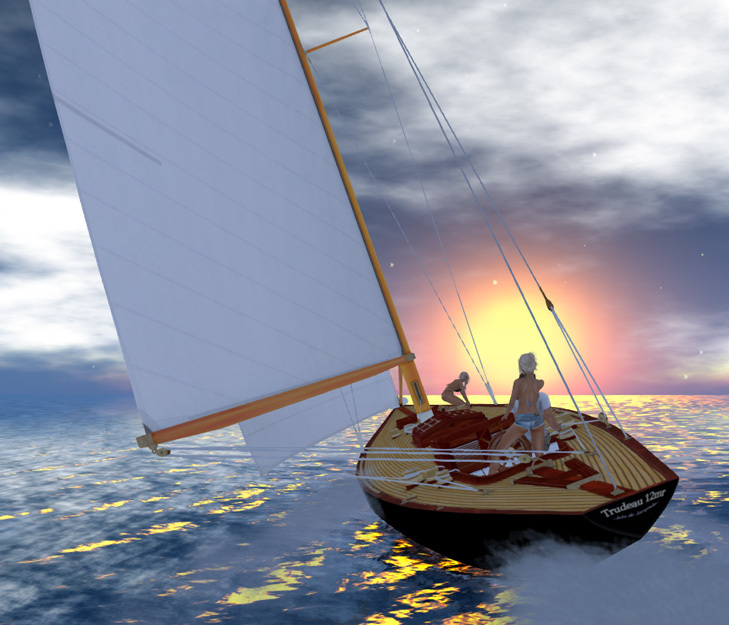 SL boat designers face an issue that RL ones don’t have to – Second Life water is not displaced by Second Life prims. We kept our 12M profile in proportions to that of RL 12 Metre yachts with their racer’s low freeboard and subsequently ended up with much of her cabin below the waterline. 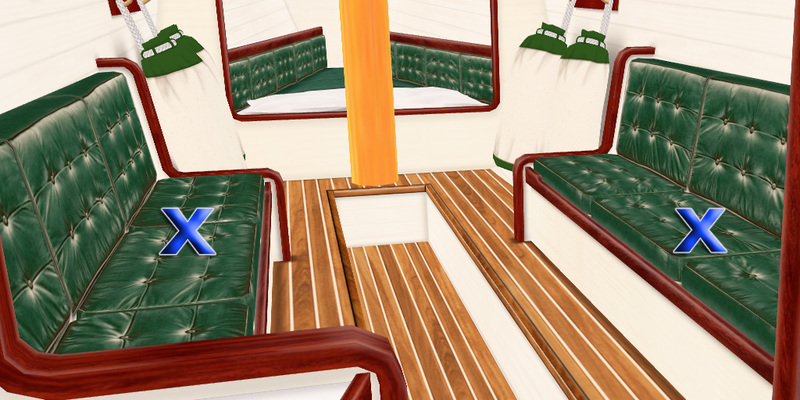 Since SL prims don’t (and likely never will) have water displacing properties, we used the old “masking” texture to keep most of the water from the cabin when moored. It works fairly well, but there are two drawbacks with this method. First, the masking texture also masks avatar parts (remember the invisiprims that came with your old prim shoes?) So any part of your AV, such as your legs, that dangle below the cabin water mask will be cut off. We took this into account when developing and selecting all of the boat’s animations. Sigh (again). One step forwards (mesh), one step backwards (shadows). Why can’t we have it all? Yay, Jackie! I will have to check this out when I get home from my business trip later this week. I was wondering what you working on and I’m so glad to see a new Trudeau. Nice Job, and like Cristalle, I am glad to see a new Trudeau. I came to Trudeau boats when one day I saw a schooner, the Larinda and this day, I told me: “I want this one” but unfortunately, it was no longer for sale and I bought a New York 30. I also bought this one. I saw the ones made by ReneMarine, very nice boats, but maybe too much big for me, and very, very, very expensives. Can we hope that one day a new Trudeau schooner will come ? Hi there, it’s possible to have all texture templates? I started to re-texture my boat and after hours of work I just realized that lot of templates are missing, like boom_crotch, wheel, cabin, hatches, hardware and all interiors. Hi Arya, eventually. My local files are a mess of layers and take time to clean up. Hi Jacqueline, thanks for the answer, I’m not interested in re-texture the interiors since i use the boat exclusively for racing, basically I’m going to desaturate the external wood parts of the boat, so possibly i think it is enough a notecard with the TGA textures. I’ll have it on the dry dock jacks. What is the prim count in that case? I’m sorry for the misunderstanding, but the boats you see here are not “real”. They exist and operate only in the virtual world known as Second Life. Hello, I think the 12m sher good. I want them to my wish textures. The sails I have already finished. I’ve also finished the name as a texture, but I did not bring it to the boat. How do I do that? I bought this 12M yacht yesterday (2017 07 05), and am having immense fun with it. I bought the Patchogue II beforehand to try out your scripting (trusting soul, I know) – and that’s fun too.